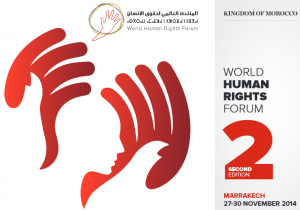 The Kingdom of Morocco will host the second edition of the World Human Rights Forum (WHRF) in Marrakesh from 27 to 30 November 2014. In December 2013, Brazil hosted the first World human rights Forum, with over 5,000 participants from 30 countries. The Marrakesh Forum took place twenty years after the 1993 Vienna World Conference on Human rights.